February 15 - This quarter afforded us the opportunity to educate our African American target audience via the UAMS Mid-South Black Expo. 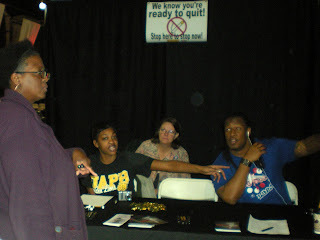 The Black Expo took place at the Little Rock Metroplex Saturday, February 15. The Expo takes place each year as a means to showcase minority-based companies and initiatives that directly target this portion of the population (i.e. 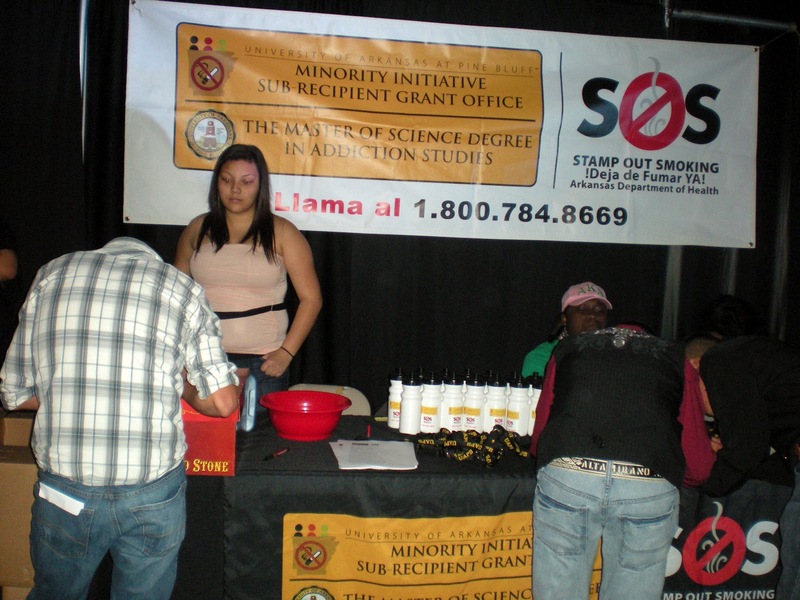 the Minority Initiative of Stamp Out Smoking). Our partnership with the Black Expo was non-traditional for this year as we sought opportunities to truly activate this event for our anti-tobacco messaging platform. For this year's event, we were able to secure not only a traditional booth to distribute collateral information, but also two additional spaces within the venue. One such space was utilized to consult individuals in the completion of the Fax Back Referral Forms. The other space/room was utilized to activate on-site quit attempts via the "Quit to Call" mechanism. We successfully secured fourteen Fax Back Referral Forms from this one-day event! Approximately 3,300 people attended this event throughout the day. February 17 - One of the final community-based events we successfully executed this quarter was the partnership with La Pantera radio station (local Hispanic radio station) in support of the highly-acclaimed Gerardo Ortiz Concert. Gerardo is a sought-after Latin Music Award Chart "star" within the Hispanic community. His concert took place at the Little Rock Metroplex. 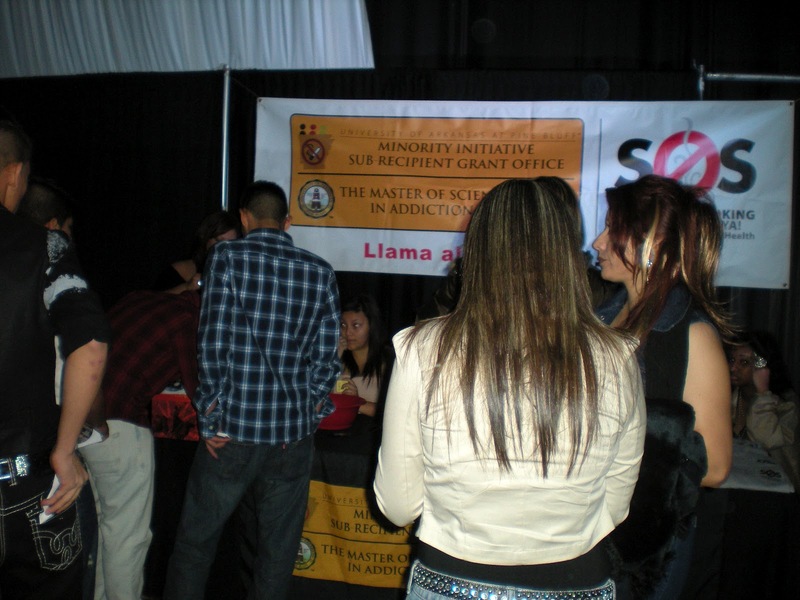 The event drew nearly 2,000 Hispanics not only from Central Arkansas, but throughout the state. There were approximately 1,600 tickets sold and 300 comp tickets. The activation of this event included the raffling of a sombrero to a selected winner. We utilized this raffle as a "draw" to the UAPB/SOS booth. Once visitors stopped at our booth, we had the opportunity to deliver our anti-tobacco prevention and cessation messaging. 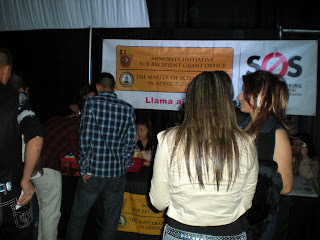 We also gathered more than 250 names and contact information from Hispanics entering the raffle. The Mississippi County Coalition for a Tobacco Free Arkansas hosted its 9th Annual Saving the Lives of Arkansas Children Health Celebration Banquet April 13 at 6:00 pm at the First Missionary Baptist Church. The church is located at 600 E. McHaney Street in Blytheville. The Keynote speaker of the banquet was Amber Bullock of the American Legacy Foundation, of Washington, D.C.
Amber E. Bullock is Executive Vice President, Program Development, for Legacy. Mrs. Bullock is a seasoned public health administrator and educator, with more than 30 years’ of experience working with various health professionals, researchers, clinicians, community-based organizations, and consumer groups on a range of behavioral risk factor public health issues. Mrs. Bullock provides oversight and direction for the Foundation’s community technical assistance and training programs, priority population initiatives, youth activism programs, Legacy’s Partnership for Healthier Communities Initiative as well as grant and program dissemination tools and resources. Her special areas of interest include addressing tobacco related disparities, community capacity building and sustainability issues. During 2011, Mrs. Bullock served as guest co-editor of a special supplement of Health Promotion Practice which focuses on training and technical assistance lessons learned to sustain social norm issues in tobacco control. Prior to joining Legacy, she served as Prospect Associates Ltd.’s Vice President of Public and Community Health Promotion and also as Director of the Coordinating Center for the National Cancer Institute’s American Stop Smoking Intervention Study (ASSIST) initiative. Over the course of her career, she has provided technical assistance and training and managerial direction on a diverse range of public health and social justice issues including women’s health, cardiovascular risk factors, multicultural competency, reproductive health, tobacco prevention, cessation programming and advocacy, youth/young adult health promotion, and HIV/AIDS. She previously served as Director of Education and Research for the American College Health Association, and worked early in her professional career for the American Heart Association, where she developed and managed a wide range of research administration, consumer health promotion, and professional education programs. Mrs. Bullock received her public health master’s degree in community health education from San Jose State University, and her undergraduate degree in human development at California State University, Hayward. She is a chartered certified health education specialist as designated by The National Commission for Health Education Credentialing, Inc. The Mississippi County Coalition for a Tobacco Free Arkansas was proud to have Mrs. Bullock serve as its event keynote speaker. 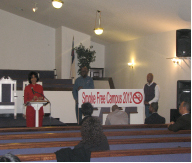 The Evergreen Baptist Church Tobacco Awareness Program was honored to join forces with The Church Without Walls 2012 presented by New Dimensions Fellowship, Bishop Eddie Yarbrough, and Founder. The event, held April 17 through April 20 at Doe’s Laundromat in El Dorado, was designed to assist minorities, as well as others, in making better choices in health decisions, including tobacco facts and other issues that affect minorities. The following Sunday, the event continued at Evergreen Baptist Church and included worship, fellowship, food, and fun. Success was achieved as follows: 100 gift packs of washing powder for machines were prepared by youth and adults; collaboration with 16 new churches who were not formerly coalition members who contributed quarters, washing powder, and bleach; 40 free dinners were given; 48 allowed us to help with clothing; 20 pledged to quit smoking with the assistance of EGBCTAP, local barbers donated free services for one per month cuts; 6 community service awards were presented; 55 prayer requests were honored and 5 participants prayed to receive Christ! On Saturday, February 11, 2012, New Hope Baptist Church, 1851 Howard Street, Little Rock, Arkansas was draped with community and public health leaders, elected officials, such as state senator, Joyce Elliot and Little Rock Mayor, Mark Stodola, concerned citizens, and members of the New Hope Baptist Church demonstrating their support for a new 100% smoke-free church campus policy adopted by the leadership of this inner-city church. The public health awareness press conference informed those in attendance and the general public of the perils of smoking and the negative health impact tobacco use has on African-American communities. In the U.S., 20.6% of African-Americans smoke, but account for only 12% of the U.S. population. 45,000 African-Americans die annually from smoking related causes. Lung cancer is the second most common cancer in both African American men and women and kills more African Americans than any other type of cancer. Coalition for a Tobacco Free Arkansas (CTFA), the sponsor of the event, encourages other churches to adopt similar policies to protect their members and others from the dangers of secondhand smoke exposure which is the third leading cause of preventable death in the United States. 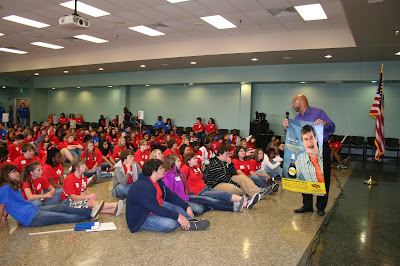 Mississippi County Teen Summit - A Great Success! Elroy Brown, chairman/coordinator of the Mississippi County Coalition For A Tobacco Free Arkansas recently spoke to more than 300 high school students at the Mississippi County Teen Summit held at Arkansas Northeasten College. Brown spoke about the dangers of secondhand smoke and the addiction to smokeless tobacco. He shared that these addictions are just as strong as the addiction to cigarettes, if not worse. Brown said No Tobacco Is Safe Tobacco. Smokeless tobacco is far from being harmless and is not a healthy alternative to smoking. The Mississippi County Coalition For A Tobacco Free Arkansas is funded by the Minority Initiative Sub-Recipient Grant Office, the Arkansas Department of Health Tobacco Prevention and Cessation Program, and the Arkansas Cancer Coalition. For information on quitting tobacco, call 1-800-784-8669.